So, you’re looking to step up your C-Arm imaging capabilities without feeding your budget (not to mention all your space) to the “C” monster. The spine, back, and pain physicians are always hogging the full-size C-arm and you're just looking to heal a hand or a foot! Logically, the first option that comes to mind is the mini-C. The compact design and tighter mag modes of a mini-C are a perfect fit for the work, but just how much will you be spending to bring one into your facility? 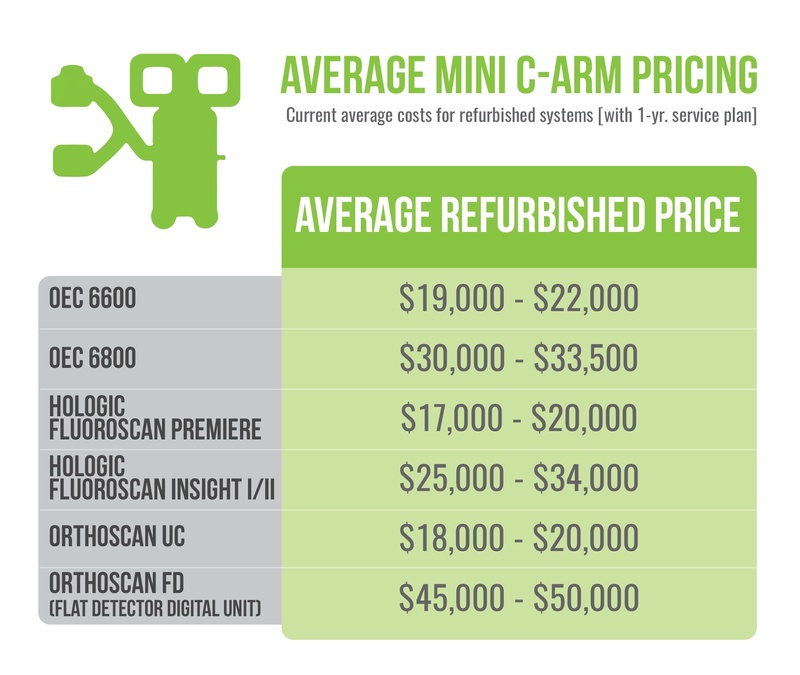 Below we'll break down how much you're likely to pay for used mini C-arm equipment as well as the services that go along with it (refurbishment, delivery, warranty, etc.). Used mini C-arms can vary widely in price. Age, features, and manufacturer will all be variables. Depending on what you purchase, you could spend anywhere from $19,000 to $50,000. To determine where your mini C-Arm purchase will land in that range, there are two major factors that come into play: equipment and services. 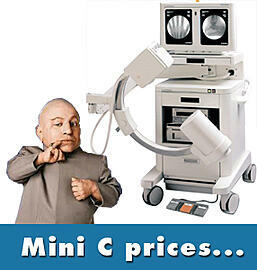 First and foremost, your price will be determined by the model of mini C-Arm you choose. Systems like the OEC 6600 or Hologic Fluoroscan Premiere will appear on the lower end of the spectrum while a flat detector digital unit like the Orthoscan FD will be on the high end. For those whose budget falls somewhere in the middle, the OEC 6800, Hologic Insight, and Orthoscan UC will likely emerge as candidates. The balance of what you spend will be on services provided such as level of refurbishment, delivery, set-up, FDA documentation, a parts and labor warranty and a brush up "in-service" or full applications training session. While you may need some or all, they are all pieces of the cost puzzle. You might also want check out "Three Criteria for Choosing the Perfect Refurbished C-Arm"
If the two paragraphs above led you to ask even more questions, you are in a good spot. Now is the time to start evaluating what your imaging needs are and weighing them against what your budgetary restraints may/may not be. This is how you’ll find the best used mini C-Arm value. Remember, this purchase is about you. The balance between equipment and services can be customized to get you exactly what's needed both clinically and economically. If you need assistance in picking the right mini C-arm equipment, or aren’t sure if you need a full turn-key package of services, please contact our Block Imaging Sales and Service Representatives to learn more. We’re here to help!